Home BuzzIn Get 100% Refund on Ticket Cancellations with RY Cancellation Cover! 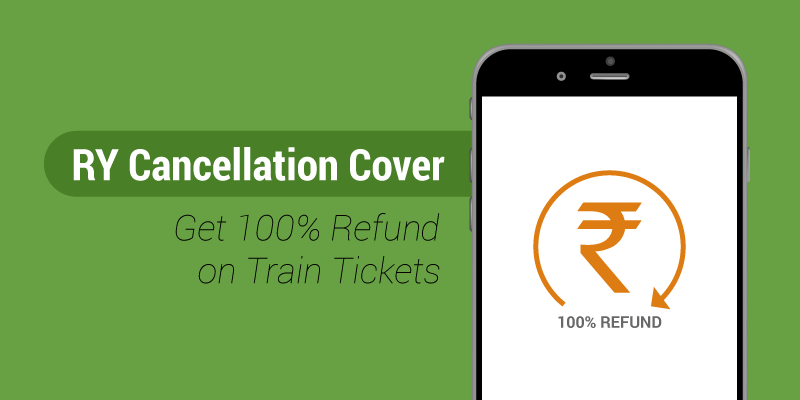 Get 100% Refund on Ticket Cancellations with RY Cancellation Cover! 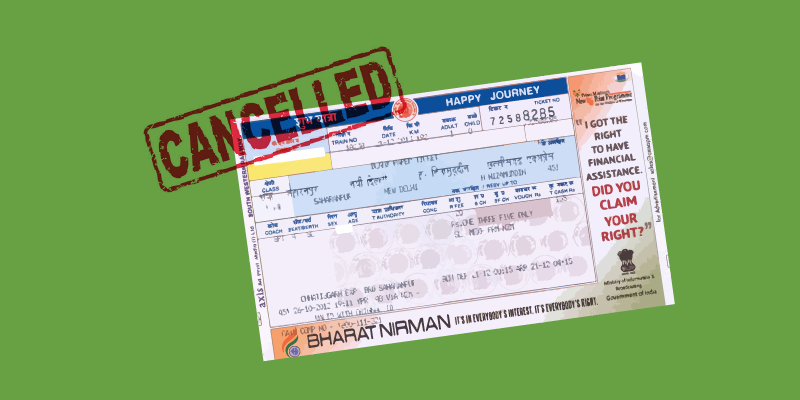 Indian railway ticket cancellation rules are not easy to understand. 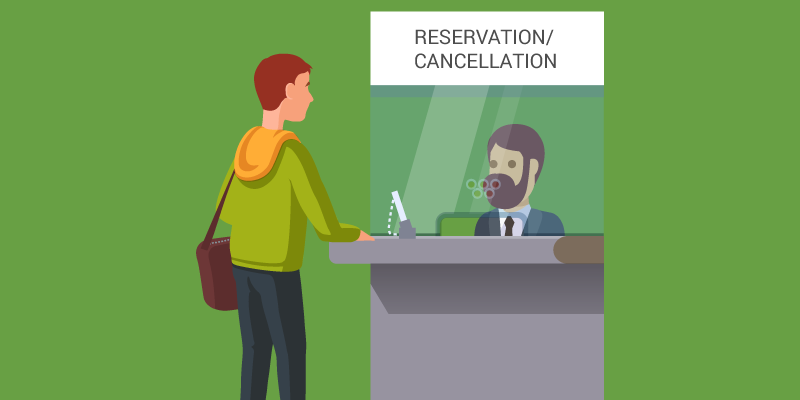 The refund you get on cancelling tickets, depends on a long list of factors such as travel class, ticket status, cancellation period, among others. So, commonplace train travelers are left wondering after train ticket cancellation about “How much money will I lose? How much money will I get back?” This compounds upon the already existing anxieties that you have in everyday life. Temptation to book early: This is obviously the leading reason for train ticket cancellation in India. Indian railways offers passengers’ two options: book your tickets 120 days in advance and get a confirmed berth OR book late and stare at the uncertain. Most people take up the first choice. But a lot can change over the course of 120 days and as a result many train journeys have to be cancelled. Overbooking just to be safe: During the rush (festival) season there is a large gap between the demand and supply for train tickets. As a result, most people do not want to take the tensions and opt for booking in more than one train. While they assure the journey, they might have to cancel one ticket or the other. Non-confirmation of tickets: In many instances the passengers have to cancel train tickets, once they get a fair idea that the ticket will not be confirmed at the point of journey. They have to start looking for other travel modes or worse still postpone the journey altogether. As you can see, in all the above scenarios it is not the passenger who is at a fault. So, why should you suffer? Understanding there was a clear need to address this at priority, we joined hands with Edelweiss – the experts of this domain for many years. After months of hard work, studying user behavior, in-depth risk analysis and detailed study of the raw data, we came up with the unique feature – RY Cancellation Cover. 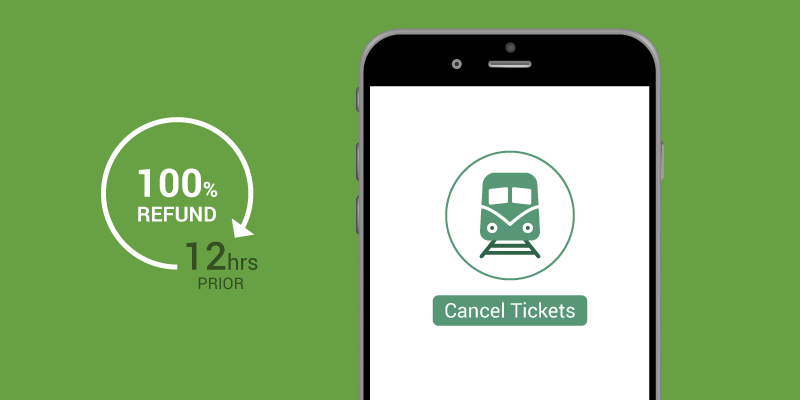 This feature helps you get 100% refund on train ticket cancellations, given you cancel train tickets up to 12 hours before the scheduled departure of your train. RY Cancellation Cover has been carefully crafted to ensure it is financially viable and genuinely useful for the end users, that is you! In less than a month, since its release, RY Cancellation Cover is already winning the hearts of train travelers across India. We are receiving plenty of e-mails from our valuable customers showering their love and appreciation towards this new feature, every day. But in the same vain we also receive many queries about this first-of-its-kind, flight-like feature and quite logically so. That is why we decided to compile the most common queries and give you answers. What is RY Cancellation Cover? As the name suggests, it is a unique, never seen, never heard before flight-like ‘ticket cancellation’ cover using which the customers can insure their entire ticket price and in the event of cancellation, claim 100% refund of their money. Your favorite app – RailYatri has joined hands with Edelweiss to craft a feature that keeps your ticket booking expenditure insured. Do I have to pay anything extra to get RY Cancellation Cover? Yes, like every good thing, this too is a paid service whereby you will have to spend a little extra amount as premium, over and above your train ticket price. 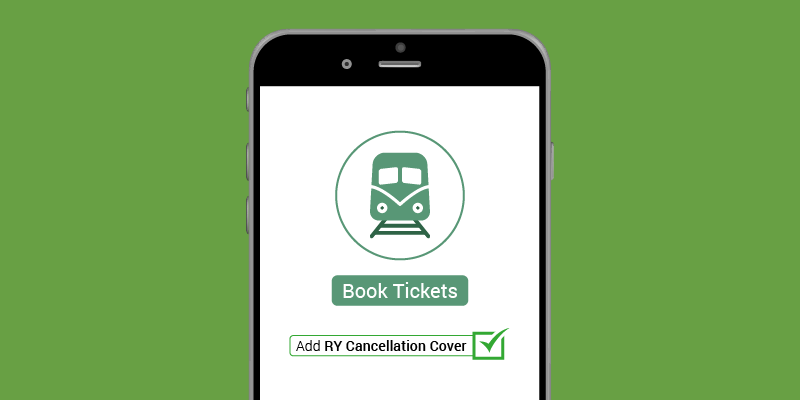 How is the RY Cancellation Cover premium calculated? Is it fixed? Is it auto-included in the train ticket price? No. We always want our customers to be well aware, and well informed before making a decision to spend their hard earned money, even if it is for any additional, best of the best services offered by us. At the time of checkout, we encourage our customers to make a conscious decision whether they wish to opt for RY Cancellation Cover or not. A detailed calculation of the applicable premium and total payable amount is also shown for complete clarity. Is there a minimum time to cancel my ticket(s) to get complete refund? Yes. Customers can get a 100% refund if they cancel their train ticket(s) up to 12 hours before the scheduled departure time of their train. Giving utmost priority to your convenience, we’ve made sure that you’re completely covered even if you decide to cancel with not even 24 hours left for the departure of your train. I hope we have clarified all queries around the RY Cancellation Cover. If you need any additional information, please write back to us at: feedback@railyatri. We promise to get back to you as soon as we can. Next articleYour app now speaks your language! Please write back to us at feedback@railyatri.in and we promise to get back to you. i want to cancel 1 ticket from 3 ticket ..? for 10/03/2019 and cancel on 10/02/2019 i have recived three tickets refund but 1 ticket amount is not refunded. Why u didn’t refund me ,yet I have submitted frequently. G Marik is a senior citizen but u didn’t allow, why?And it is only the reason for cancellation. I have booked already her ticket from rly counter. Yesterday I was booked 3 tickets in Kumar Non Ac bus but operator said was cancelled and they are not ready to adjust anywhere. So kindly refund my money back asap without fail and any deductions. सुजल जी अगर आपने रेलयात्री डॉटइन से टिकट बुक करवाया था तो आप खुद ही इसे कैंसिल कर सकते हैं. आर्डर बुकिंग पेज में इसका विकल्प है. अगर आप ऐसा करने में असमर्थ हैं तो हमारे टिकट बुकिंग एजेंट को 8010500300 पर कॉल कर उसकी सहायता लें सकते हैं. धन्यवाद ! Need to cancel ticket of one passenger in a combined ticket of 3 passengers. How to go ahead.